Hawaii homeowners – apply for your Homeowners Exemption on Real Property Taxes. The exemption will reduce the taxable value of your home, thus reducing the taxes you pay. Choose to submit your application by September 30th online, by mail (form BFS-RP-P3) or in person at either of the two real property assessment division locations OR at any satellite city hall. The statutory deadline for the home exemption is September 30th, effective for the next tax year beginning on July 1st and ending on June 30th. For example, submitting your home tax exemption application by Sept. 30, 2018 will make it effective for the July 1, 2019 – June 30, 2020 tax year. If the September 30th exemption deadline falls on a Saturday, Sunday or legal holiday, the deadline is extended to the next succeeding day which is not a Saturday, Sunday or legal holiday. Make sure you make it official and change your mailing address via USPS here: Official USPS Change of Address. Best practice is to also notify employers, financial institutions, utilities, insurance companies and cell phone providers directly (even if you have electronic statements via email) of your address change. Are you a veteran or active duty service member interested in utilizing your VA loan benefits to purchase a home in Hawaii? Give us a call at 808-792-4251 to talk with a VA Loan Specialist or fill out our online application here. 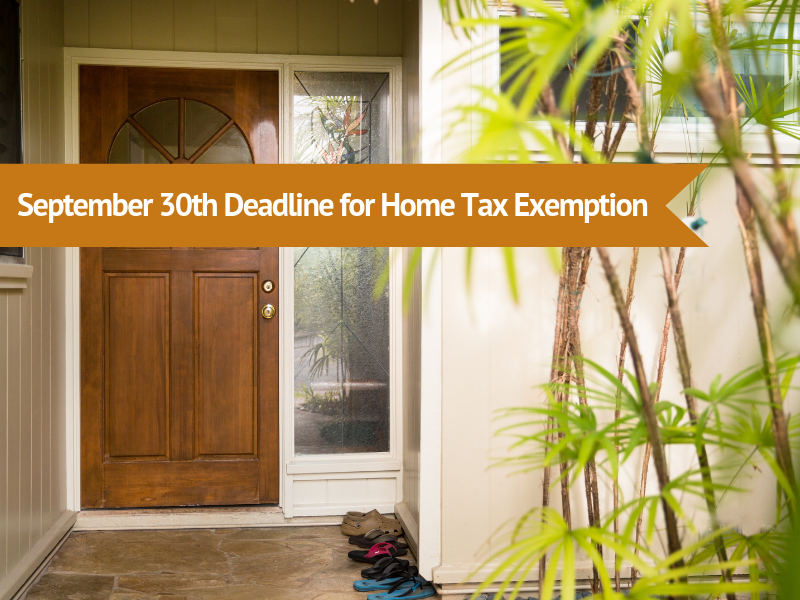 Attention Homeowners: Submit Your Home Tax Exemption Application by Sept. 30th!